It’s been way too long since I’ve just posted something fun and/or goofy about the greatest television program in existence – Doctor Who. Check this out from one of my favorite pop-culture web sites, io9, and tell me you didn’t at least crack a smile. IDW’s Doctor Who comic book has been on my mind since I started this blog last year. As a casual comics fan who has been “out of the loop” for a while, and with far less free time and spending money than I used to have, I’ve been searching for titles that make sense for the way I read comics now – dipping in and out while following storylines online and through blogs. I actually spend more time reading ABOUT comics than I do actually reading comics. Wow! Here’s a new mini-sode that serves as an interlude setting up The Day of the Doctor. Fantastic! This preview has me dying (and hopefully regenerating) for the 25th. 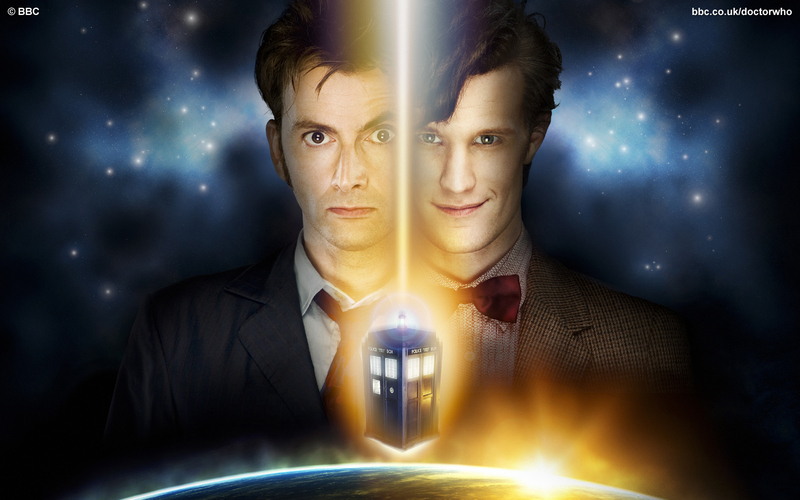 The Day of the Doctor broadcasts 11/23 and is in theaters around the country on 11/25. Get your tickets while you can. So, it’s not every day that I put up posts that are not comic book-related. Then again, it’s not every day that I pound my fist on the table, shouting “YES!” And then my wife shushhes me, and I mutter “oh yeahhhh….” This trailer got me pumped up in ways I never thought possible. Casual Doctor Giveaway – Winner! I am excited beyond words for this! The piece of art that melted my heart at Comic Con this year was Sara Richard’s Tenth Doctor print. I’ve talked with Sara, and we’ve arranged a giveaway for Doctor Who fans worldwide (although, in the U.S. I will pay less shipping). 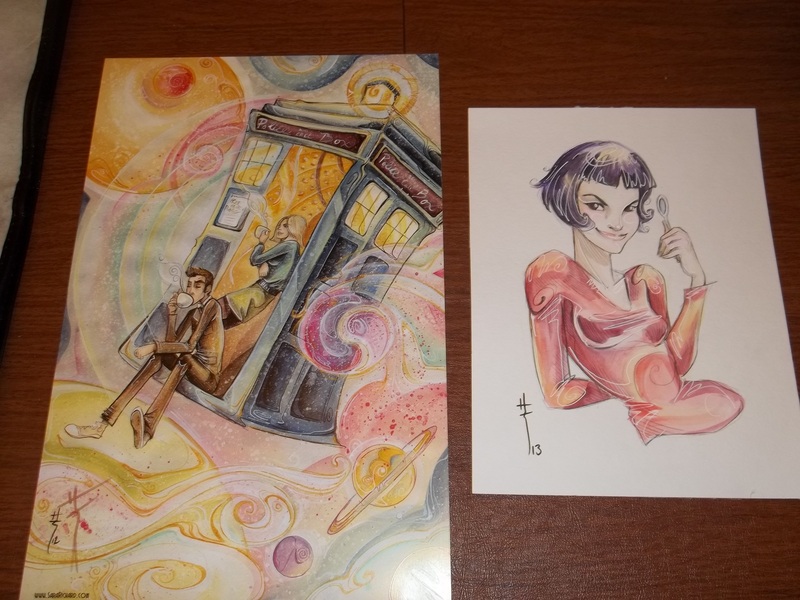 This contest combines my two latest passions – Doctor Who and the art of Sara Richard. If you are not a fan of the Tenth Doctor (I’m looking at you, Greg…) Then, you at least must want a print of the TARDIS. This is so beauteous, it takes my breath away. 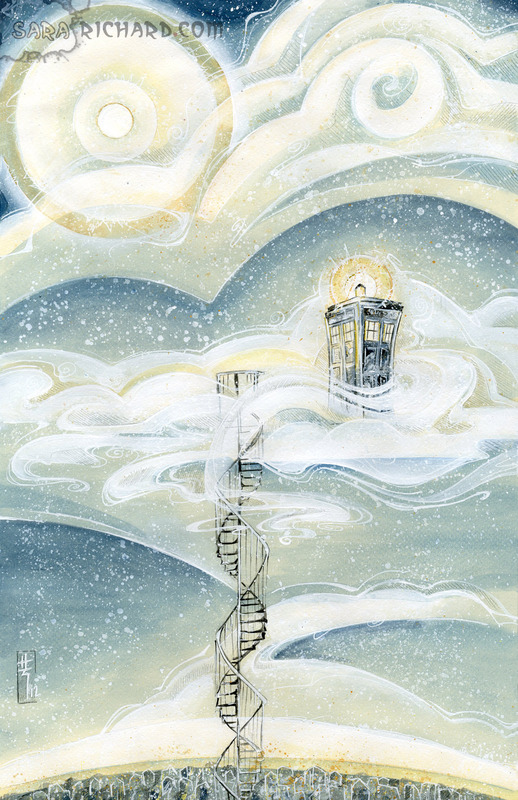 If the TARDIS in the clouds doesn’t get you, how about that double helix staircase? I wish I’d had enough cash to buy both of these prints at Comic Con. But, alas, I did not. I only purchased this one. However, you can have one of these prints at no cost to you, if you follow a few simple instructions. 3. Be somewhat lucky, because I’m going to pick one winner at random. So let’s argue about who the best Doctor is. And, then, let’s hug it out and agree that the universe is an amazing place. 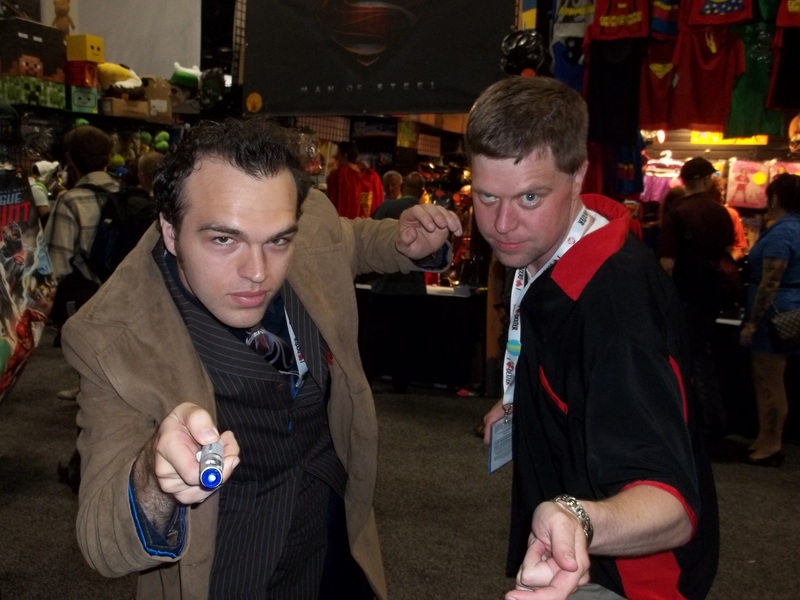 Also, while you’re here, you may want to check out the Doctor Who cosplay from Comic Con or my friend Greg’s thoughts on the Doctor Who TV movie. There are many talented artists at San Diego Comic Con each year. Earlier this week, I posted the fantastic Run Lola Run art I purchased from Tess Fowler. I asked Tess if she knew anyone who had interesting Doctor Who art for sale, and she recommended Sara Richard as an artist with an interesting, colorful Doctor Who print. Boy, was she ever right. 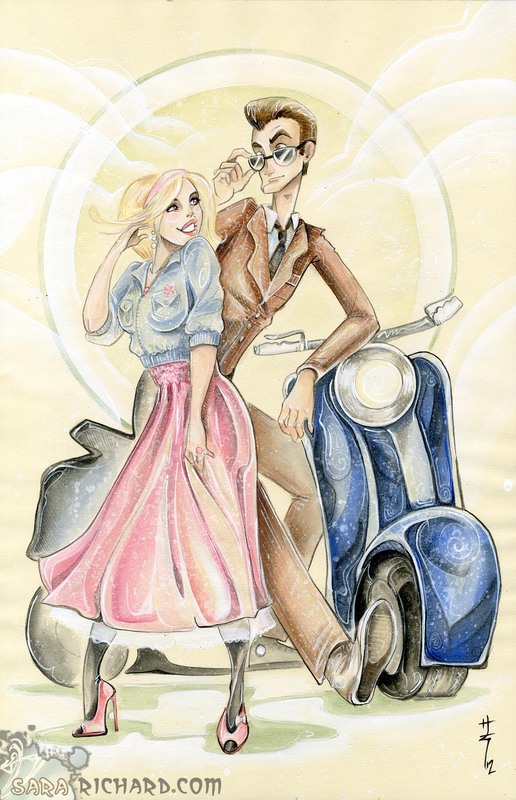 I fell in love with her print of The Tenth Doctor and Rose. I think it perfectly captures exactly what I love about the series. Fun, whimsical, and oh, so, happy. It’s a perfect slice of simple companionship and happiness amid the chaotic beauty of the universe. Looking through Sara’s portfolio, I thought I’d ask if she could do a commission. 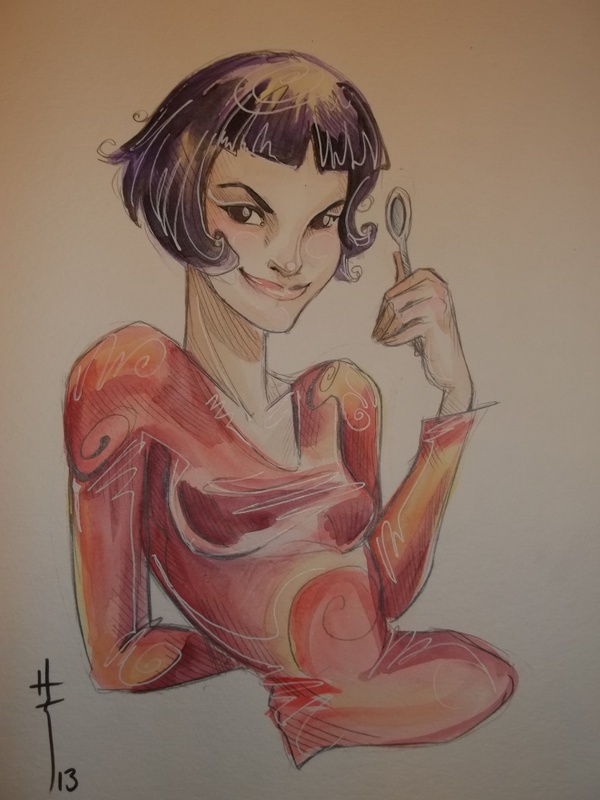 I have loved the movie “Amelie” since the day I saw it at the Dundee theater. I think it’s the only movie I’ve ever seen where there was actually a standing ovation at the end. I thought Sara’s style was perfectly suited to capture the joy and wonder of “Amelie”. Happily, she accepted the job and I could not be happier to add this piece to my collection of original art. Thank you so much Sara for everything. It’s impossible for me to look at these and be blue. Check out Sara’s artwork online at www.sararichard.com . Click around to find her portfolio and store. And buy something there. You’ll be glad you did. The scans of these pieces can’t come close to matching the beauty and color of the originals. As referenced in an earlier post, every Comic Con experience becomes its own thing. Comic Con isn’t something you do. Comic Con is something that happens to you. You set a course, pick a few guiding principles, and go along for the ride. 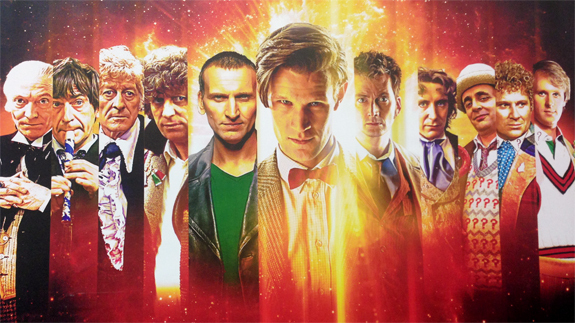 2013 is the first Comic Con I’ve attended since I started watching Doctor Who. I was always aware of the presence of the Doctor at the Con, but heading into this Con, I was determined to connect with some Who fans and get photos of the costumes. All the Doctors. Get ready to take a step to the left, Mr. Smith. A few notes to begin. I‘ve watched only the new Doctor Who. Of that, I’ve seen only the first two seasons. I am madly in love with David Tennant in the role of the Tenth Doctor. Even though I can’t imagine why any person would like anyone else in the role, I am determined to give Matt Smith fans the benefit of the doubt. After all, if there’s anything I’ve learned from watching Doctor Who, it’s that everyone should chase their passions with their whole heart and soul, no matter how daft they seem. Me and him. Right here. I love the Tenth Doctor. That’s actually the one thing that I enjoyed most at SDCC in my search for other Who fans this year. Whovians (as I discovered we are called) have an unbeatable zest for life. We are the Wolverines of zeal. There’s a relentless, optimistic view that informs the television series, and that infects the lives of the Whovians I met. I’m not saying every single Who fan is this way, but the ones passionate enough to dress up and head to Comic Con sure are. Having said all of that, I am not ready to move on to another Doctor. I will punch you in the face, Eleventh Doctor, if you don’t live up to Ten. I heard no arguing about which Doctor was the best. No one seemed to care who knew the most about Doctor Who trivia. New Who fans were always welcomed with open arms. Even though some of my best friends are MSTies, I still hear a Joel vs. Mike debate on occasion at Comic Con. That never happened with the Whovians, even though there are literally 5.5 more incarnations to argue about. Instead of arguing, there was a relentless drum banging of super-passion for their own favorite Doctor. There wasn’t a negative word spoken about any of the other Doctors, companions, or anything else. Sure, people grumbled about certain episodes being stronger or weaker, but overall if you had your favorite Doctor, people were content to listen to you rave about him until it was their turn to spread some love for their own favorite. So to all of you who had to listen to me rave about my man-crush on David Tennant, go ahead and comment with your own favorite below. Now, a couple of notes on the costumes. When I downloaded my photos, I was not surprised to find only photos of the Fourth, Tenth, and Eleventh Doctors. First off, I haven’t seen the classic series, so it’s entirely possible that there were Doctor Who cosplayers that I missed because I didn’t even recognize the outfits. I did take pictures of a couple of people that I thought might be classic Doctors, but people later told me I was wrong. It was easy for me to spot Nine, Ten, and Eleven, since I’ve seen them the most. And, Four’s scarf is instantly recognizable. 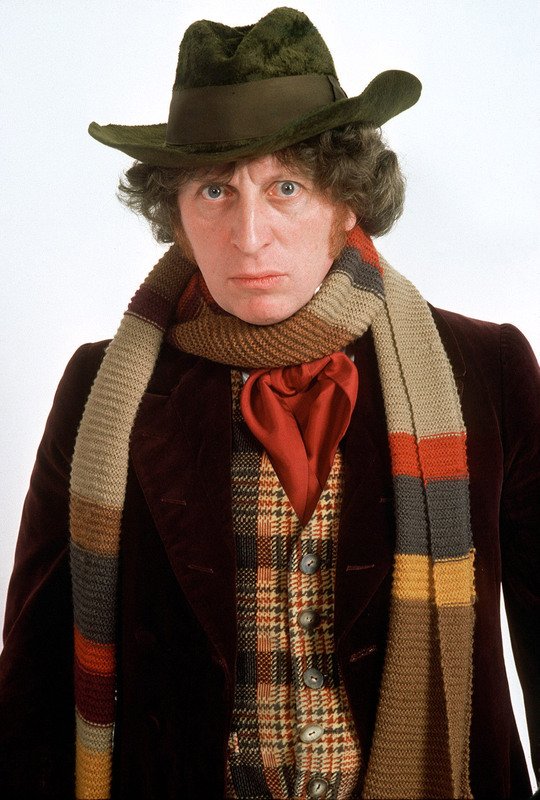 If you don’t know this scarf, there’s something wrong with you… even the CCG knows the scarf. Also, I was not surprised that I didn’t spot a Nine. The dress doesn’t really seem distinctive, and there isn’t as much geek love for Eccleston as for the other new Doctors. I would guess that there were no Nine costumes in the convention, but I would be glad if someone could point me to a photo that disproves my hunch. That said, there were a lot of Doctors at the Con. It’s a great costume and is easy to pull off. Talking to the people, they also love the fact that it’s not bulky, awkward, or hot. It’s easy to walk the floor, look, shop, and attend panels in the suit. Plus, everyone immediately knows you are ready to have a conversation about Doctor Who as you’re standing in line for the next panel. I had even thought about going as the Tenth Doctor this year, and I’ve never done a costume for Comic Con. That’s the good news for Doctor Who cosplay. The bad news is that there are so many Doctors, it’s hard to pull off something unique or different from the others. Some people managed a distinct look by getting a different prop from a specific episode and/or being a girl. But, it’s tough. The really bad news, though, is that I got some great advice on where to get a Ten costume for next year. (Sorry, I should have said that the “really bad news” was specific to my wife). So, on to the pictures. Go the the SDCC Photos page. There’s commentary on all the photos. Be on the lookout for a poll on the Doctors. Just be aware that Gerry and Marty are the best Doctors of all time for reasons you will learn when I post my daily recaps. As always, questions/comments are not just welcome, but are appreciated. 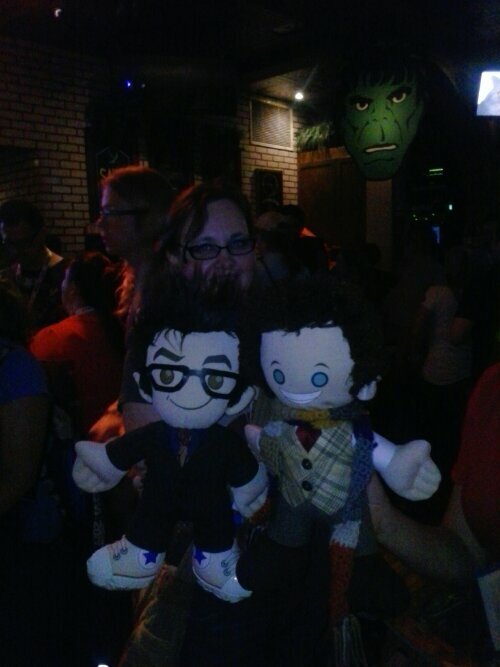 These two awesome, crafty girls made their own plush versions of the Fourth and Tenth Doctors.